Started Legend of Qin 秦時明月 last Christmas break and I couldn't put it down long enough to write my first impressions. It has been such a fun ride thus far, and I'm finally down to the last 10 episodes so it's now or never. Episode 1 begins with Jing Ke attempting to kill the Qin Emperor. I say attempt because we know he ultimately fails and in this version, Jing Ke dies in the hands of his friend Ge Nie (Lu Yi). Jing Ke fathers the main protagonist Jing Tian Ming (Jiang Jin Fu) who grows up years later to be your average kid, oblivious to his true identity. However, all is not what it seems as an unfortunate incident occurs where Tian Ming wakes drenched in blood after what should have been a scuffle with the Qin soldiers turned into a slaughter. The Qin Emperor catches wind of the massacre and sends men to capture Tian Ming while Ge Nie simultaneously leaves the palace walls to rescue his friend's son. Although Tian Ming tries to escape initially from Ge Nie then from the Qin soldiers, an epic fight ensues and Ge Nie single-handedly defeats 300 soldiers incurring fatal injuries in the process. Gratefully indebted to Ge Nie, Tian Ming begs the famous doctor Duan Mu Rong (Michelle Chen) to save Ge Nie. Duan Mu Rong feels nothing but disdain for Ge Nie whom she deems a traitor, but she reluctantly agrees to treat him when she realizes that Tian Ming is indeed Jing Ke's son and that there might actually be more than meets the eye. 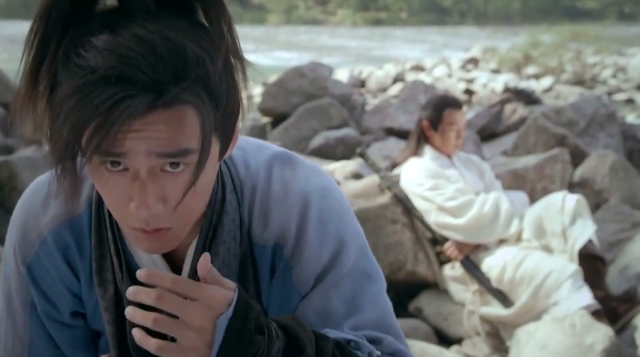 First Impressions: I love how the drama artfully combines a graphic novel and a historical wuxia, then sprinkles it with fantasy elements, which works for the most part. Legend of Qin starts with a bang, recounting the monumental assassination attempt directed at the Emperor of Qin. It is a well-known story in history books and widespread in pop culture thanks to a blockbuster movie called Hero. Yet it touches just the tip of the iceberg since the main event follows the adventures of Jing Tian Ming, a young and inexperienced boy endowed with hidden powers that will surely put him in a position to accomplish great things. The supporting characters and their storyline are equally if not more intriguing and I was most curious to learn about Ge Nie's motivations and his courage to move forward despite being shunned by everyone he holds dear. Rightfully so as Lu Yi and Michelle Chen starring in supporting roles was odd enough to begin with, and it only made sense upon realizing that they are pivotal to the story and their OTP not any less compared to the main leads. Even if you don't like the Ge Nie and Duan Mu Rong tandem, romance is abound with a handful of other couples to root for. I see potential for something epic given such a large cast portraying people that are both fictional and real. We are introduced to various factions such as the Mohists, Xi Shi Tribe, Seven Killing Sect, Ju San Liu Sha aka Quicksand and the historical figures from the Qin Dynasty, each fighting for their own cause. On another note, I have read bad reviews from those who have seen the original animated version so opinions might vary greatly if you're one of the former. I'm so close to being done; just waiting on the Eng subs of the last two episodes. Personally like the other love stories, like the musicians, more than the main lead. Main lead still too ignorant for me to like him. Again, my thoughts exactly:) Don't understand why the fantasy wuxia these days always has a hero that needs growing up and in this case, I could barely see any improvement with the main lead and it's so late in the series already. JUST FINISHED and don't want to spoil anything. i finally finished, wow felt like so much happened over the last two episodes as if watching a different drama (not a bad thing tho). have the same thoughts initially about the main lead, then in one episode, they mentioned he is only 17 years of age. after that saw him in a different light and eventually liked the character. just finished it! as you have rightly mentioned, romance is abound with multiple forms of love on full display, from unrequited to mutual, unrealized to expressed, sacrificial to persistent. enjoyed the swordplay and liked the fighting scenes, the progression of the characters are well in tune. some of the plots may have flaws but it can be overlooked as it does not break away much or you can easily try to put some understanding and still enjoy the series :) heart warming and timely soundtracks especially once it is interpreted using a flute type musical instrument. the series started a bit slow but i think it was mainly due to multiple storylines and characters setup. by episode 10, i already started to get hooked and once i reached the 40+ episodes, i find myself unconsciously saying "bi xia" in the tone of zhao gao a couple of times, hahaha :) by the time i reached the last few episodes, i find myself doing a marathon of the series in order to break the anticipation and excitement of what's next :P really enjoyed this series and good night!